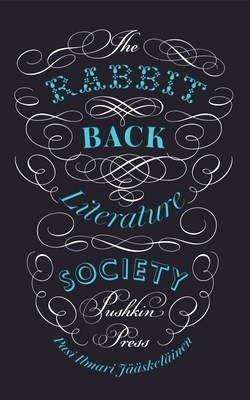 The Rabbit Back Literature Society is a strange book to start to describe; in it the quirky and fantastical rub shoulders with the everyday world and 'serious' themes - so imagine something on the lines of a cross between Jasper Fforde's Thursday Next novels and Twin Peaks. Rabbit Back is a town populated as much by statues inspired by Laura White's novels as it is by people, a place where dogs congregate outside houses as if waiting for something or someone, and where having a 'mapping' taken to detect mythological creatures in your back garden is commonplace. I found it a little slow to start, as the opening chapters were not quite what I'd expected from the blurb, but as Ella investigated further into the mysterious behind-the-scenes world of the Literature Society my curiosity grew. 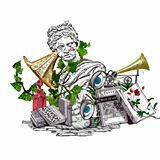 Gradually a picture emerges of how the Society members, and even the founder, have exploited each other, lifting plots and characters for their best-selling novels straight from real life. If you fancy something a little different, give this a go; it won't disappoint. This sounds absolutely amazing, I'm putting it on my Goodreads so I don't forget. The cover is really beautiful as well!